GENEVA, Dec. 20, 2016 – Human rights activists are outraged that the UN General Assembly Hall in New York today hosted yet another tribute to brutal dictator Fidel Castro, with the participation of UNGA president Peter Thomson. “It was bad enough that both the UN General Assembly and the UN Human Rights Council in Geneva already held separate tributes with a minute of silence to honor the human rights abuser’s memory,” said Hillel Neuer, executive director of UN Watch, an independent non-governmental human rights group. Today’s “special commemorative event” honoring the leader of the Cuban revolution was organized by Cuba’s UN mission, and drew numerous UN delegates and officials. 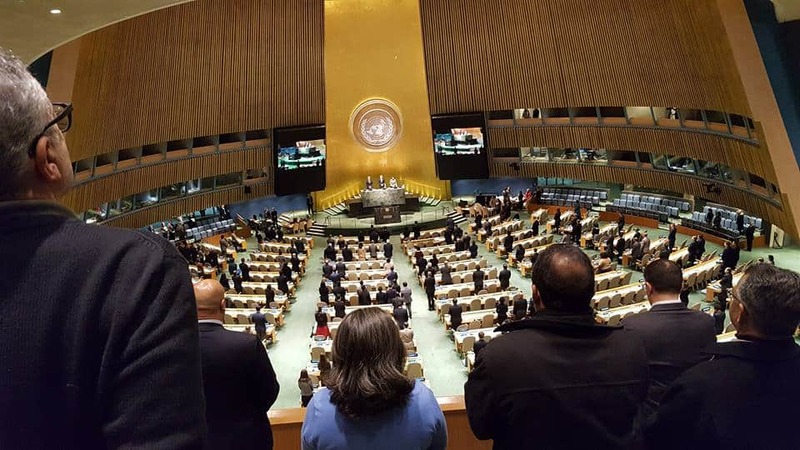 “It was obscene for the UN General Assembly to commemorate a brutal dictator, though not all that surprising given that the same body just reelected the Communist government of Cuba as a member of the council, and given that it also elected many other despotic regimes, including Burundi, China, Russia, Venezuela, Qatar and Saudi Arabia,” said Neuer. Above: UNGA presiden tPeter Thomson should not have participated at Cuba’s propaganda event. Nor should the UN’s publicity machine have lent itself to this shameful cause, as in the tweet below. Castro’s Cuba refused to allow a single UN human rights expert to visit the country, with one exception. Cuba allowed in UN official Jean Ziegler, a radical Swiss socialist politician, co-founder and 2002 recipient of the Qaddafi Human Rights Prize, who was appointed to the UN at Cuba’s urging. Ziegler turned his visit into a propaganda exercise for the Castro regime, both during his visit, and in his later UN report and press conference.